Retired Financial Times music critic and self-confessed ‘steamer dreamer’ Andrew Clark always writes a great book, beautifully written, meticulously researched, every word and photograph included agonised about. 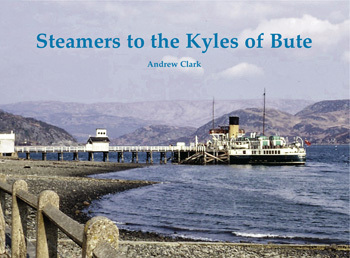 Companion volume to his other three Steamers to books this time we head off to the Argyll coast and t he Kyles of Bute which have inspired awe and a sense of wonder in travellers for over 200 years, one of ‘earth’s glories’ as the author describes it, and for a bonus ‘you don’t need to travel far� It’s on our doorstep’. Using sepia and colour rare images from his vast personal collection of Clyde steamers material, Andrew tells the story of shipping through the Kyles. Locations featured are Tighnabruaich, Ormidale, Auchenlochan, Loch Striven, Colintraive, Rhubaan, Toward and Rhubodach.